autobodynow has no other items for sale. The Khi-hinge Concealed Hinge Jig adds precision and quality when it comes to the installation of cabinet doors using hidden hinges. This easy-to-use tool helps users align hinges accurately so they can install doors that work great and fit well. It works with an ordinary drill and carbide tipped bit, and allows users to drill to the desired depth thanks to the depth stop collar. There are 235 items available. Please enter a number less than or equal to 235. Sales tax may apply when shipping to: IA*, MN*, SD (6.0%), WA*. I Used my Kreg hinge jig on eight kitchen cabinet doors today. I installed blum compact concealed hinges ( 38 Series hinges). I set my Kreg boring tool at 3mm for the door edge distance. The tool worked great and my doors turned out perfect. I recommend the Kreg hinge jig. UPDATE !! !, April 15,2018 : I JUST FINISHED MY KITCHEN CABINET DOORS. I BORED 52 TOTAL HOLES ( 26 DOORS ). THE CABINET DOOR FRAMES THAT I BORED WITH MY KREG JIG WERE SOLID OAK. THE KREG JIG WORKED FLAWLESSLY !. I CLEANED THE WOOD SHAVINGS FROM THE JIG AFTER EACH HOLE. THE LAST HOLE THAT I BORED WAS JUST AS EASY AS THE FIRST. THE BIT AND HOUSING BOTH LOOK PERFECT. I'M SURE THAT I COULD DRILL MANY MORE HOLES WITH THIS UNIT. I HIGHLY RECOMMEND THIS JIG. I had 18 cabinet doors to bore (36 hinges). This contraption began disintegrating by door 11 (22 holes) - and totally useless by door 13. Drill bit dulls quickly, then plastic parts melt from the heat of the drill-bit shaft and cause hinge holes to be completely out of whack. Subsequently, hinges end up out of line and doors hang crooked. So...if you're only drilling 10 or less doors, it should be okay. Anymore than that - you'll need extra bits ($20 each). Also consider blowing it with compressed air while drilling. As my dad always said..."this was almost a good idea". I ended up having to buy a second jig just to finish the job on my kitchen cabinets. The problem with the jig is that the hole that the drill bit rides in is just plastic. It should have a metal bearing for the bit to spin in not just a hole in the plastic body of the jig. Before I realized what was happening the plastic melted from the friction of the drill bit. I came very close to ruining one of my cabinet doors by having the hole end up dangerously close to the edge of the door. 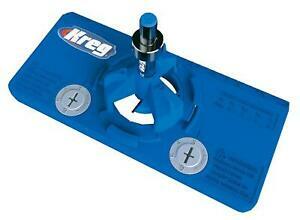 If Kreg would just insert a metal bearing in the plastic body of the jig it would be a great product. If you buy this jig just be sure to clean the saw dust out of the plastic bearing and lubricate this area during the job. This worked very well on my oak cabinets, perfect alignment every time. Easy to use. Jig and bit held up perfect for 34 uses, easily could good 3 times that. I have had this tool for about a month now and used it to do a full set of doors for a kitchen. It did all the holes perfect and I am very pleased with the jig. It was very easy to set up and use and in a very short time I had all the doors drilled. I would recommend this to anyone doing a kitchen door rehab.